if you want to order 7" just mail us at info@superfly.pl Artist: xRob Black Title: Boss the Ripper Format: 7" / Digital download Genre: Early reggae / funk / ska Label: Superfly Studio Cat. No. : SF014 Release Date: 15.06.2012 Artwork: Superfly Design xRobBlack -a Poland-born keyboardist, arranger, composer, and producer. Influenced by his father’s musical fascinations, he would commune with Afro-american blues, soul, and broadly understood music of the ‘60s. His enchantment with Caribbean rythms began in 1998, turning out to be a starting point of his musical path. In his quest he got down to the roots of reggae music, discovering the perfection of its primal form. Early Reggae became the main line of his artistic expression. Having co-operated with numerous bands, Rob got down to work on his own material. His productions feature unique sound which incorporates references to classic Jamaican music from the turn of the ‘60s and ‘70s. Catchy melodies, played on Hammond organ and interwoven with vintage guitar sound and pulsating bass, are its trademark. 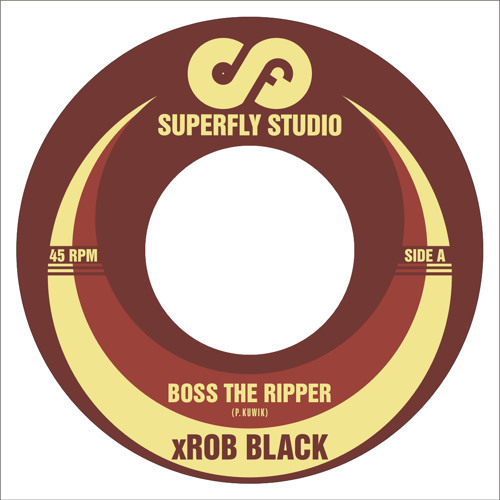 “Boss the Ripper” vinyl single published by Superfly Studio is xRob Black’s first solo release. wicked sound on the organs!